Although we are experiencing reasonable temperatures today (around 23 degrees with light rain in the morning), the weather has been hot hot and humid all the way from Italy to Berlin. We expected this in Italy, but Berlin? I suppose there has to be a little hardship for us on this trip. 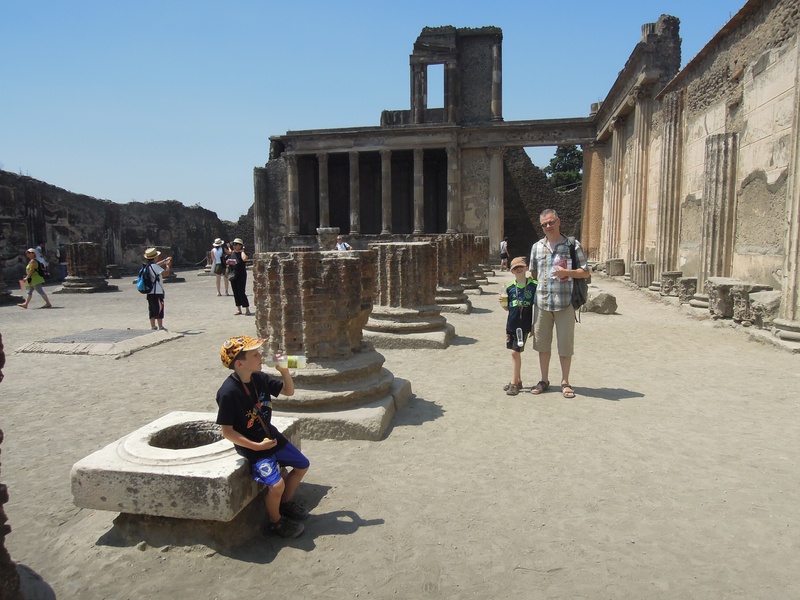 On the way here, we crammed in a two-hour stop in Pompeii. Not ideal, but it was still interesting. The kids took over the camera (for the most part) and led the tour with enthusiasm. I’m usually pretty stoic in all sorts of weather, but was definitely struggling here. I really want to go back to comb over the ancient town thoroughly, but this will have to wait for a time when we can travel in the Spring or Fall. I’m not even sure what my favourite part was….I just couldn’t concentrate on anything. The kids liked the Roman crosswalks the best, hands down. They raced from one to the next, hopping over the elevated stones (which were for both traffic-calming and for helping pedestrians avoid walking in waste water flowing down the streets). Stephen really wanted to find the plaster-castes of ancient disaster victims. We expected them to be in a prominent museum display, but instead found them tucked in a storage area with a bunch of other artifacts. We were glad to have finally found them, but I was a little melancholy after seeing them in there. Then came the air-conditioned flight from Napoli to Berlin. Heaven! We dragged ourselves out of the hot claustrophobia of the bus and up the stairs into billowing clouds of misty, super-cooled air pouring into the cabin from vents all along the walls. It was like walking into a UFO on an old movie set. After our perfect flight, we expected smooth, efficient German public transit into the centre of Berlin. Super easy. But of course we struggled to get tickets from machines that broke down in succession (we went through three before success) and then ran for a train that should have already left but was suspiciously sitting there waiting. It continued to sit there for another 25 minutes as we tested to see whether homeostasis actually works. It was horribly hot and humid. And Berlin has no air conditioning anywhere. In the end, we almost made it through a nice dinner, sweaty and exhausted as we were. Landon could barely sit up straight through the meal and eventually staggered back to the flat to vomit before falling into a deep sleep. The next day was unusually hot as well (35+), but we planned it well. Or, threw the plan away, to be more accurate. 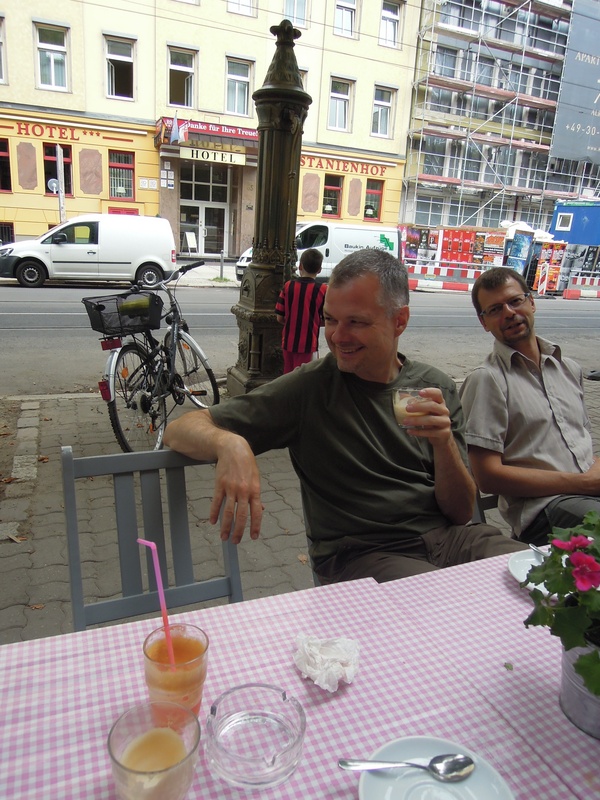 We found a great Berlin brunch in a shady courtyard and lingered from breakfast straight on into lunch. Then we found one of many lively parks and enjoyed playgrounds, water parks and the return of Quentin’s stolen sandles (mysteriously and discretely left close to the trampoline by an an old lady Jelena had the wits to follow). And now here we are…in a complex city that I have been consciously thinking about in the context of its recent history in order to appreciate it fully. However, I’ll leave these thoughts to detail in another post.